What does the Great Pyramid of Giza have in common with a sea rescue vessel and an industry robot used in car manufacturing? Individual cable solutions from Lapp! We deliver cables wherever they are needed in the world, regardless of how complex or particular the requirements might be. Our experienced cable experts work with you to develop precisely those solutions which you require – from preassembled single conductors to complete cable systems ready to be installed, from standard cables which have been optimised to meet your specific requirements to highly specialised custom products which have been designed and developed to your exact specifications by our technicians and engineers. We would be delighted to offer you personalised advice. We are also more than happy to come on-site, preferably in the planning and development stage of your project. 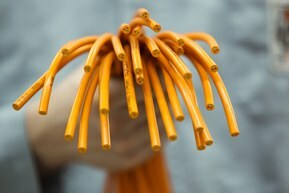 This way you gain the maximum benefit of our expertise in the cable technology field right from the start. Our goal has always been to find the best possible solution for you. For us, this means products and systems which are completely credible not only in terms of functionality and quality but also profitability.